Particularly for eCommerce businesses, the courier service that you choose for your business will have a big impact on how your customers feel about you. The courier may be the only human face that customers associate with your brand, which is why it’s so important to make sure you are working with the right one. From costs to customer satisfaction, the courier service you choose can have an impact right across your enterprise. It’s important to ensure a good quality courier service but this doesn’t necessarily have to mean expensive. Shop around to find a courier with pricing that sits well with your budget. Look out for couriers already working in the areas you are shipping to who might be able to do discounts on routes they already cover. Be wary of the cheapest couriers – the lowest cost does not always equal the best deal. Will you have access to tracking? Most of your customers today will expect to be able to track deliveries while they are in progress. Tracking also provides a valuable trail of accountability in terms of whether the package was delivered, to whom and at what time. If you have access to tracking then you’ll be able to swiftly deal with any issues that arise and you can easily solve some of the most uncomfortable customer service situations, such as alleged non-deliveries. If you need a combination of super fast services, as well as slower and more budget-friendly options then make sure the courier you choose can give you plenty of choice. It’s often far simpler to work with one courier able to provide a range of services than to have to manage multiple different couriers for your various business needs. Most courier services should be able to provide you with a wide selection of different options, including same day and next day delivery services, as well as shipping that takes longer but costs less. 84% of people now trust online reviews as much as they would a review from a friend because they are reliable and often accurate. So, before choosing your courier do some research into what is said about them online – there are lots of sources for reviews, from the courier’s own website testimonials through to Google or other independent review websites. You can also ask the courier for references from other businesses they have worked with. 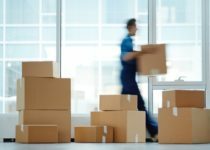 From a smart uniform to branded vehicles or renowned standards of professionalism, couriers can vary widely in terms of the impression they present. Think about what you’re looking for when it comes to the moment your customer opens the door and choose to work with a brand that can deliver on professionalism as well as service. We offer a wide broad spectrum of professional courier services at a range of different prices – contact the UCS team today to find out more. next post: How can you go the extra mile for your customers over the Christmas period?